With effect from 25th May, 2018 SCIBA has updated the way in which they handle and store your personal information in compliance with the Data Protection (GDPR) Act 2018. At Sussex County Indoor Bowls Association (SCIBA, Association, us, our, we.. all relate to the Sussex County Indoor BA) we take your privacy very seriously. Your Club Membership personal information is shared with SCIBA in order we can administer the County Association and provide you with the benefits of being an Affiliated Member. We hold your name, home address, landline and/or mobile telephone number(s); email address; date of birth (age related competitions and related matters), gender, personal car index number and make (club and county car parking) still photographs, CCTV (where clubs provide for security monitoring), sometimes medical flags (with specific consent), Parent and/or Guardian contact details, signed permissions where required, safeguarding information on Under 18’s and vulnerable adults; Under 25 registrations, money records for competitions and related Association business, All items of your personal information are required in order SCIBA can effectively and efficiently operate as the Sussex County Bowls Association. Your personal information is secure and safe with us. We do not apportion your information outside of the Sussex bowls family but may share parts of it with our National Governing Body (NGB) EIBA Ltd. for administrative purposes and National competitions. Sussex County Indoor Bowls does not sell or in any other manner release your information beyond the Sussex bowls family. Your information is stored securely with the County Secretary and/or the County Welfare & Compliance Officer. Hard copy is locked in secure storage and electronic copy in an industrially encrypted file on the County’s computer system with access limited to relevant County Officers. All redundant information is securely disposed of when it's no longer SCIBA related and affiliated member discontinues their club membership. Hard copy is cross shredded and electronic copy permanently deleted. The need to hold any of your information is reviewed at the end of each indoor bowls season. If we cannot hold personal information we cannot serve our membership properly and members cannot individually benefit from SCIBA Affiliation or enter County Competitions, play in County representative games or involve themselves in the myriad of professional services the Association offers. At anytime of your choosing you may put in a request to know what specific information we hold about you and we will tell you. Where we need your particular consent for something we will ask beforehand for your tacit permission. You have the right to ask us not to hold all or part of your personal information and we will comply with your wishes. If you do wish us to delete personal information you should be aware it may influence your affiliated county bowls membership but we shall advise you at the time of any dilution that may result. Our Data Protection and Privacy Policies are published on this website and copies are available to download. Further information and for inquiries please contact the SCIBA County Welfare & Compliance Officer or the Sussex Indoor County Secretary. Contact details are listed under “Officers” on the homepage of the SCIBA website. SCIBA is registered with the Information Commissioner’s Office (ICO) Registration number: ZA319202. Many of you will have known Brenda Mockett who recently passed away. She was Lew Mockett's wife and she and Lew have been good friends to bowls both outdoor and indoor. I know that a lot of you will wish to pay your last respects to Brenda who was a former indoor member of Horsham & District and Worthing (Field Place) Clubs and an established Sussex County Women's Bowls Association bowler of significant distinction in her own right. There will be some who would simply like to show their support for Lew at this difficult time in the same vein as he supported us over so many years whilst in Executive office. Brenda's funeral will be on Monday 11th June, 2018 at 2.20pm at Worthing Crematorium but I have no details to hand as to the wake but if and when I receive them I shall publish them on this page. Sorry to report back that Father and Son pairing of Rob & Ajay Morphett put up a great show in the National Finals of the Family Pairs but were taken out by a very strong Essex duo...but only just. The Morph's went down 14 - 17 in the end but get this...they were 0 - 11 down after 5 ends and clawed it back to 9 -11 by 10 ends. By 15 ends the score was 12 - 16 and with this event being limited to 18 ends the Essex pair held out to win only to go out of the competition in the very next round themselves to a sound thrashing 15 - 4 from Carnmoggas....sounds like it's really tough when you reach this level doesn't it?! In any event Morph's well done getting to the the final stages and hope to see you in there fighting again next season. 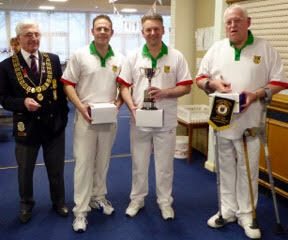 The day proved unlucky for the Adur pairing in the National Over 60 Pairs competition. John Godfrey & Lee Cooper put in tremendous performances to reach the semi-finals of the event where they faced a Victory IBC pair... going down 11 - 18. The final was eventually won by a pairing from Essex. Unlucky guys but still a fantastic achievement to get so far. Our Over 60 Inter-Club Double rink were only narrowly beaten by a paltry three shots in the semi-final by the eventual winners Nottingham IBC but what a good show by the Sussex men who took the Nottingham teams to the very edge of victory playing on Nottingham's home green as well which was an immense advantage for their opposition. Our players must have bowled their socks off and really put the frighteners on Nottingham taking them so close. The finals scores were John Godfrey 16 -19 and Terry Honnor 23 - 23 so it must have been quite a game of bowls all round and once again I say well done to all in their amazing accomplishments! Congratulations to Adur on reaching the National Semi-Final of the Over 60 Inter Club Double Rink being played today at Nottingham IBC. The teams of: Lee Cooper, Barry Ward, Tom Palmer & John Godfrey along with Ken Holden, John Hide, Roy Bainbridge & Terry Honnor will be slugging it out with a local Nottingham Double Rink for a place in the National Final. Both John Godfrey and Lee Cooper (Adur) will be trying to go the distance in the National Over 60 Pairs to boot. We wish them lots of luck and will be watching to see how it pans out! In the National Mens Over 60 Singles our hopes are pinned on John Godfrey (Adur) who has progressed to the final stages of this competition. Well done John and the best of luck for tomorrow when the first round opens at Nottingham IBC. The best of luck also to Rob and Ajay Morphett (Egerton Park) the Father & Son pairing....as they prepare this weekend to compete in the final stages of the Family Pairs National Competition. They are a great team with that special understanding that can only come from sharing the same genes and I expect them to do very well in this comp........no pressure guys! 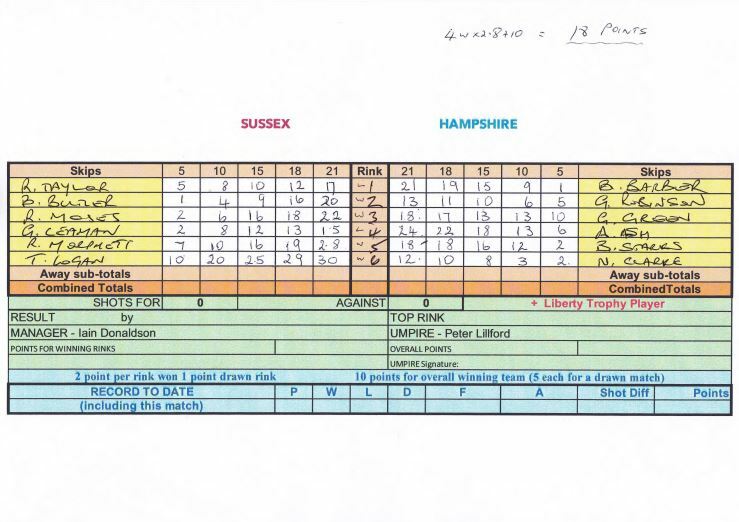 Over the next few days I hope to be able to bring your good news on these fronts but I'm sure you will join with me in congratulating all those Sussex Indoor bowlers who made it to the final stages of the National Competitions this year. Quite aside from the personal glory they bring upon themselves for reaching the pinnacle of the National competitions... it allows Sussex County and every indoor bowler of it to bathe in their reflected glory! The competitors contribute immensely in enhancing the reputation and integrity of Sussex Indoor Bowls and that is no bad thing for all of us! Go Sussex! May I also take this opportunity of once again congratulating Ajay Morphett (Egerton Park) on being selected for England in the Under 18 International Trial being held on the 29th April, 2018. We wish him well and every success in it. Ajay, for those who don't already know is a prodigious young talent who has already earned his England credentials as an Under 18 International. A Double Gold Medallist already the only way is up for him and it won't be long before he will be out of that age group and into the Men's Under 25 ranks. With his abilities he will definitely go far.....of that there is little doubt.... and our best wishes for the future always go with him. Congratulations once again to Worthing Pavilion BC on winning the Sussex County League Division (1) and to Eastbourne & District IBC on winning Division (2) of the Sussex County League 2017/18. Well done to Worthing IBC for coming runner up in Division (2). Both lower clubs are promoted to to Division (1) for season 2018/19 where we wish them every success in next year's Sussex County League competition. The County League tables are displayed on the relevant page of this website for all of you who wish to scrutinise them further. Although all results are not in and the table cannot be finalised these positions are confirmed with outstanding games to be played making no difference to the standings of these three clubs. I have just received the sad news that Deputy Vice President Darrell Petts (Denton Island) suffered a stroke over the week-end and is in the Royal Sussex Hospital. He has lost the use of his right arm, has no speech and is unable to swallow. We hope he is able to make a full recovery and we wish him well in that regard. There are no hospitial visits allowed as there is an outbreak of Norovirus but I shall send a "Get well" card to him on behalf of all bowlers in Sussex. I will provide further updates as I get them. In a riveting singles match at Horsham Indoor Bowls Club this evening I had a front row seat watching last year's Singles Champion Rob Morphett (Egerton Park) play the excellent Mark Strong from Worthing Pavilion B.C. in the Sussex County Indoor Singles Championship and friends...it was a corker with Rob finding himself 5 - 0 down before he could catch his breath and score a single....accurate drawing from Mark being the big difference. 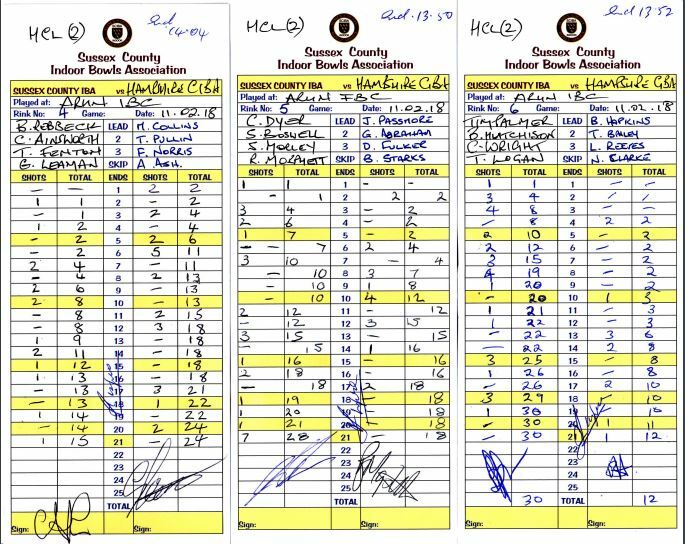 From then Rob scored consistently adding 2 to his single in the 6th end then going 2, 2, 1, 4, 2 to the 10th end. Mark grabbed a single in the 11th, dropped a single in the 12th then went 1, 1, 1, 3 to reach to just one shot behind Rob at the 16th. At 20 ends both bowlers were square at 17 - 17 and it was simply lovely draw bowling from Rob that was keeping Mark at bay! 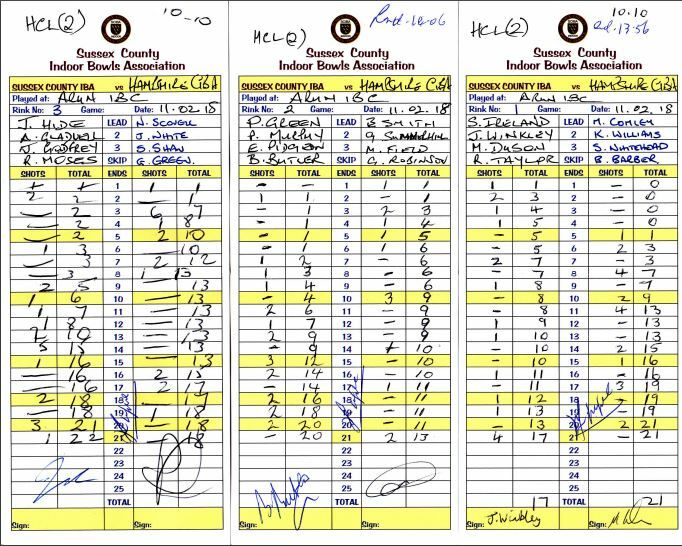 On the 21st Mark took a single that put him in front of Rob for the first time since the early ends and at 18 that was the red line for Mark. Rob from somewhere found an extra gear running into the winners box with a 1, 2, 1 and finishing the match 21 - 18. It was the relentless draw, draw, draw of Rob Morphett that won this heavyweight battle because don't get me wrong... Mark Strong did not bowl badly and at 17 all it was still anyone's match. It was simply the extra gear that great Champions seem to have in them and when Rob changed into overdrive in those final three ends nobody could have stayed with him. ...it was an exhibition we were treated to as Rob Morphett closed off the game for his hatrick of Sussex Indoor Singles wins... One of the finest Champions Sussex has had in recent times and your very worthy 2018 SCIBA Singles Championship Winner. Having applauded the winner let me just say that Mark Strong was appearing in his first County Singles Championship but it certainly won't be his last based on what I saw and Rob will have to keep looking over his shoulder because Mark and the other hungry Sussex Indoor competitors are on his heels. All in all a fabulous match to be a neutral! 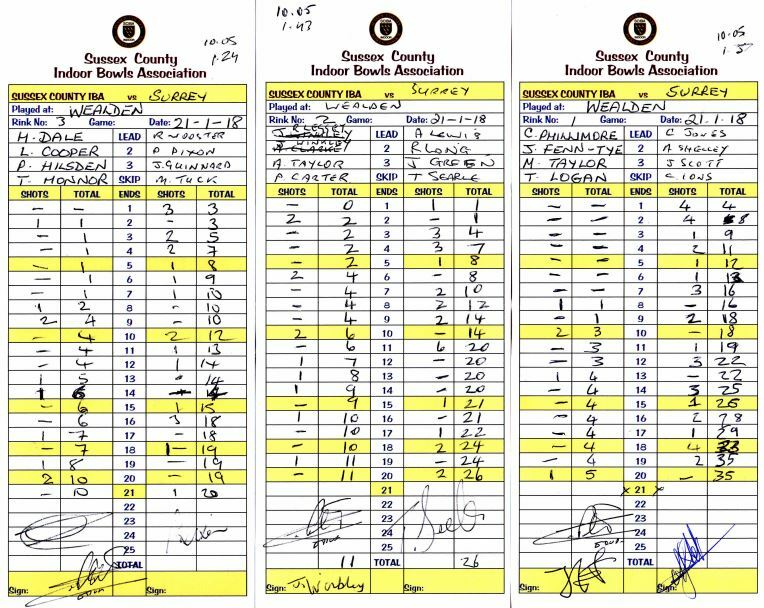 It was a pity the game had to be played virtually "in camera" due to events affecting the National Under 18 date amendment caused by a correction in the EIBA schedule. I can only apologise. These things happen despite every effort to play our finals on a clear week-end. We can't set them up any earlier than they were this year so this might occur again...let's just hope though, that will not be the case in the future. The Singles Final this evening concludes the SCIBA Competitions for 2018. It just leaves me to thank all the competitors for their prompt results emailed, texted and telephoned to me and for their equally prompt posting or scans of their scorecards. I received 98% of them which has to be some sort of record! I wish the same good fortune to my successor as Competition Secretary next season and I hope all of you will treat him with the same respect and good humour that you did me. To the winners I say very well done. To the finalists that were runners up my commiserations but isn't it good you can look forward to doing it all again from next October! WELL DONE & CONGRATULATIONS to WORTHING PAVILION B.C. 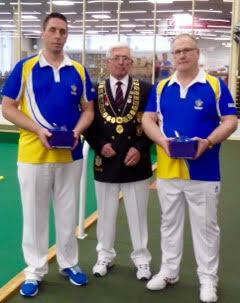 who are now confirmed as the Winners of the Sussex County Indoor Bowls Association League. No disrespect intended to the other clubs but how nice to see the League winning club being shared round for a change! Wresting it out of the hands of Egerton Park is a fantastic achievement particularly when you see now many times Egerton have been the victors and before that Adur who have featured so many times in the County league winners enclosure. I trust Worthing Pavilion will now proudly display the League Trophy in their club cabinet for all to see. Winning the County League is an immense achievement for any club when you stop to consider how many highly competitive matches have to be won to accomplish it...well next job is to hang onto it and once again that will not be easy! Bathe in the glory for a while but get ready come next September/October when it all starts over! The photographs of this year's County Finals Winners have now been received by me and after some selective cropping etc. will be displayed on the Competitions page of the site in the next couple of days so please revisit the website from time to time to view them. Sussex County Indoor B.A. Pairs Champions 2018: Rob & Ajay Morphett (Egerton Park) who won one of the tightest matches ever running out winners 19- 18 against Worthing Pavilion's Simon Davey and Richard Dray. Sussex County Indoor B.A. Triples Champions 2018: Matt Ives, Graham Ives & David Miller by 18 - 17 shots fought a titanic struggle against the Egerton Park trio of Carl Dyer, Steve Boswell & Seb Morley. Fantastic bowls for the neutral spectator. Nail biting angst for the players 'supporters and one of the tightest final ends you will ever see played! Sussex County Indoor B.A. Fours Champions 2018: Matt Ives, Graham Ives, Andy Gladwell & David Miller won 23 - 12 beating a spirited scratch four from Eastbourne: Paul Davies, Nigel Morris, Simon Perry & Phil Garrett. A match where the final score didn't tell the full story... nevertheless a convincing win by the Horsham team. I'm sure we shall see this Eastbourne team appear at the County Finals again in the future! Welcome to all four Eastbourne players who qualified for their county badges through reaching this final and we hope to see them represent the County at Badge Matches in years to come now that they have all nailed this indoor bowls landmark! Sussex County Indoor B.A. Unbadged Singles Champion 2018: Jason Walter (Wealden) 21 - 5 against Richard Corkett (Arun) taking nothing away from Jason who found line & weight straightaway and bowled relentlessly to the jack but I am sure Richard will accept this was not his day and he found the relatively cold conditions of the morning and the carpet too much of a challenge. All those who know Richard realise he just had "a bad day at the office" because we know full well that he is a very, very much better bowler than he was able to show us today! Richard will undoubtable feature again in the SCIBA finals and at representative inter-county matches throughout the coming seasons. Jason qualified by winning this final for his County (Gold Distinction) Blazer Badge, which was presented by the County President and we hope we shall see him selected for many representative inter-county matches in the future. Well done Jason.....tremendous bowling today. Sussex County Indoor B.A. Under 25 Singles Champion 2018: Jason Walter (Wealden) 21 - 19 in a "can't take your eyes off it" battle against Jonathan Fenn-Tye (Preston) in one of those games where it's such a shame one of the players has to lose! A match that will live in the memory for sometime to come! Although Jonathan was the runner up he didn't go away empty handed.....the County President had the opportunity of presenting him with his County Blazer Badge and his Home Counties League Blazer Flash for representing Sussex a minimum of three times in the Home Counties IBA Inter-County League that runs throughout the season. Congratulations to both players for giving us such an enjoyable final, to Jason for winning his second final of the day and to Jonathan for becoming a fully fledged badged player for Sussex County IBA. The future of Sussex Indoor bowls is safe if we can hold onto players like this. Both now approach the senior ranks of players being close to concluding their Under 25 playing status. The SCIBA County Singles Championship 2018 is being played at Horsham IBC later in the week once both competitors are clear of commitments and I shall post the result as soon as I can after the match. This came about because Ajay Morphett was in the Under 18 National Finals at Burton on Trent on the same day as our County finals. Legally he must be accompanied by a Parent and with his Mum unable to take him due to illness it fell to Dad, Rob to do the honours. Rob Morphett (one of the finalists) spoke to me about the problem and said he would concede the Singles Final to Mark Strong in order to chaperone his son to Burton. Mark Strong from Worthing Pavilion who is his opponent wanted to play the match and was not content to accept a concession. Those who know Mark will appreciate how competitive he is and will understand his wish to play the match, albeit on an alternative date. SCIBA does not accept that a Final should be conceded unless there is absolutely no way of resolving the issue...much less the "blue ribbon" event of the competition season! As Competition Secretary I ruled the match should be played to it's natural conclusion on an alternative day which both finalists have agreed to. It is a shame the final could not be played on Finals day, however, the SCIBA Singles Championship will be properly decided between the two finalists and a winner will emerge! It would appear that not everyone is happy with that resolution and feel Rob Morphett should be disqualified for being unavailable for the final. That is a perfectly legitimate way of bringing matters to a conclusion. However, in my view it would not have been in the spirit of the sport to have followed that course not least because both players very much want to play the game and to not have it decided in such a fashion. We should applaud Mark Strong for his determination to play the match come what may..... and Rob Morphett for being willing to concede the singles final in the first place in order to chaperone his son to the National U18 Finals in Burton. Neither player should be criticised and nobody has any reason to play the "blame game." Both communicated with me and wearing my Competition Secretary's hat (and also as organiser) I have ruled within the laws of the sport as I see fit... as well as in the interests of fairness and commonsense. That decison has been both impartial and without prejudice to either bowler. I trust that this explanation will put paid to any unsubstantiated rumours that may be about to circulate on social media or any other jungle drum! Thank you to all those who have supported the decision. Although unable to present it on Finals Day due to the absence of the receiver from our event for personal reasons I should like to announce that ROY TUOHY (Eastbourne) was honoured with the Sussex Martlet Special Recognition Award for his outstanding and selfless contribution to Sussex Bowls over many years. I have been lucky to have Roy as the County Assistant Secretary and I know from personal knowledge the valuable work he undertakes on behalf of not just SCIBA but every single affiliated member. 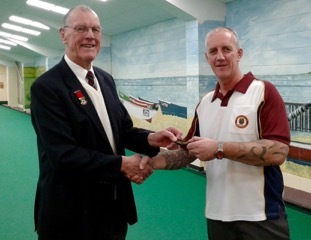 The award is a special distinction not lightly given by Sussex County IBA and Roy is one of those rare individuals who defies us to find suitable superlatives that have not previously been used to distinguish his service to Sussex Indoor Bowls! The Sussex Martlet Special Recognition Award for 2018 is conferred on Roy Tuohy with our profound thanks and our enduring esteem. A copy of the Citation, Certificate and Blazer Badge will be displayed on the website in the next few days. As most of you know the County Finals, this year being held at Horsham IBC, have been split mostly over two days due to a late National competition date going into the diary after we had set our own Finals date. It created a bit of a hiatus in the schedules but we had to get on with our own finals as best we could. The County Pairs Championship was played this morning between Rob and Ajay Morphett (Egerton Park) and Simon Davey and Richard Dray (Worthing Pavilion). I have to tell you it was one of the most gripping games of indoor bowls I have witnessed with the score going first one way and then the other and reaching a climax on the last end when the Pavilion pair held two shots and game. With his last wood Rob Morphett sought to run into what was a packed head to spring the jack. His bowl set off tight from the start and missing the head by a margin but struck a wing wood and cruelly for the Pavilion team, ran into the pack disturbing it enough to take one shot from it. Lucky? yes...but it was one of those games when one had to ride any bit of luck going because there wasn't any to be had up to that point with both sides playing spectacular draws end after end. However, the shot was taken and the match was tied with an extra end to play but despite a truly mammoth effort by Davey & Dray they capitulated... and with it the Pairs Championship went once again to the Champions of 2017, the Father and Son duo of Rob and Ajay Morphett. So congratulations to them and commiserations to the losing finalists but the real winner from this match was "bowls" with the standard of play on show nothing short of astounding.... I kid you not! Roll on tomorrow but if all the matches are as tight as this one I'm going to end up a nervous wreck!! Well done to all the players. Those "darn Morphett's" from Egerton Park have hit the headlines again by reaching the National Finals of the Family Pairs competition. Rob and Ajay beat the Worthing Pavilion Father & Son duo of Clunky & Hayden Clarke 19 - 7 to make it into the finals where on the 15th April, 2018 at Nottingham IBC they will contest the first round of the finals against a pair from Essex. They have both got to be in with a good chance of reaching the final itself and we all congratulate them on making the National Finals and wish them both the best of good fortune for the last few steps to claiming the trophy. No doubt the Morphett clan will be somewhere nearby to cheer them on..... so break out the good luck charm bracelet Amber and start polishing it up! Please see the programme below for this year’s County Finals. Due to both National and County League commitments the County Singles Final will be played on another date that I will advise when it is confirmed. Otherwise as we stand today (12th March) the County Pairs will be played on Saturday, 17th March, 2018 at Horsham IBC at 9.30am. Apart from the Singles the remainder of the competition Finals are as shown in the programme for Sunday, 18th March, 2018 at Horsham & District IBC. Supporters are most welcome as are spectators. The Restaurant and Bar will be open on both days…the restaurant from 8.00am on the 18th March. There may be further changes to this programme so please re-visit the SCIBA website for the latest version which will be displayed on our Home Page. Good luck to all the competitors and let’s look forward to an excellent couple of days’ bowls. A. Parsons w/o A. Parsons 20 A. Parsons Conc. Paul Davies, Nigel Morris, Simon Perry & Phil Garrett. Latest news that the county fives on 25th February has been cancelled due to lack of entries. With our reduced numbers organising friendly matches or additions to the county schedule for the Under 25 players is quite limited. If the opportunity arises for a game perhaps against another county, the Sussex senior players, the U31 Sussex Indoor girls, or even the Sussex Past Presidents be sure we will grab it with both hands! Nigel Craddock will also keep his eyes peeled for any possibilities during the season. If you as an individual player have an idea for a friendly addition just let Nigel or myself know and we'll help you organise it. Endeavour with such openings to pitch for a minimum of four (4) rinks if you can as anything less is generally not considered truly viable. In the past such matches have been arranged only to fall down on the Under 25 lads dropping out at a late stage and as a result these other groups have been reluctant to offer an additional fixture. Not only the players are let down but more importantly clubs booked for the match and catering for meals after the game lose out significantly and often where rink concessions (cost wise) have been negotiated for the match the club will not be too happy to offer them again! Sussex County IBA often has to make restitution in lieu of non appearance of teams or a break down in match arrangements and of course we only have very limited funds that, frankly cannot be wasted! All in all best avoided as I'm sure you will understand! If you want these added matches you have to show that you will support them all the way. In any event we shall see what we shall see and hopefully a little extra will become available. If so the rest is up to you guys to ensure its' success. Team sheets for matches arranged off the published fixture schedule will be shown on this page...........come back and check regularly. Click on underlined match number to DOWNLOAD a selection sheet. Well done to Sussex on reaching the Semi-finals keep it going lads. Points: 14 for an overall shots win, 2 for each winning rink, 1 for each drawn rink. HCL3. Match was cancelled by Kent due to adverse weather conditions therefore the points under the HCL Rules were shared 11 points each. Each County plays one of the home counties in a badge match through the season, sometimes twice, however, one of the matches (pre-nominated) qualifies for points in "The Trophy League" played for in an Inter-County league format. 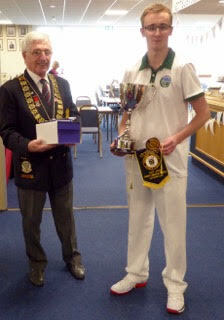 Here is the Sussex President holding the Deric Homes Memorial Trophy which is played for in a league format and sponsored by Surrey County Indoor B. 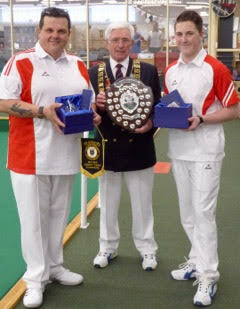 A. Sussex has won the league with a game in hand which is a fantastic result for the County and its’ bowls players……. we shall discount the suggestion of a surprised look on Barry Baillie’s face... but he had just minutes before been presented with the trophy by the Surrey President, Peter French and he was slightly in shock as it was an unexpected moment! Peter French has now explained that as Sussex cannot be caught in the League even if they were to lose their last match so it was timely that Sussex was playing against Surrey in Badge Match No: 9 at Grattons IBC on the 22nd February…. hence the extra surprise!. 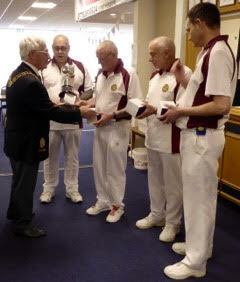 Congratulations to our President and to Sussex bowlers who have represented the County so well in the badge matches that were pre-eminent in this competition. Thanks also to Surrey County IBA who sponsor the Deric Homes Memorial Trophy League and who put the effort in maintaining the league table and sustaining this competition each season. A few years back we were able to move the county towards selecting stronger teams for the big games such as representative matches and this result is something of a vindication for taking a harder line on selection as well as making it that much more challenging to gain county colours through the badge credit system. I hope it will be just the start of winning ways for Sussex in the “important" matches and that we can slowly but surely pull ourselves up by our bootlaces and once more gain recognition for being a very tough county to play against…I have always believed in Sussex and Sussex bowlers and know that we have the players NOW in this county.. to win everything there is at County and National level and I hope we can once again gain a victory in the blue ribbon event of the season..the Liberty Trophy.. before too long. We have a fine crop of younger bowlers coming through and winning their matches against strong opposition. It looks very likely, and I hope I’m not jinxing it by saying this but Sussex is close to winning the Under 25 Inter-County League again this season and it is these up and coming young men who will one day steer Sussex to the very pinnacle of bowls in England. We should all put our faith in them to get the job done and simply believe in them,….they can accomplish the task. As for this occasion I know it must have been a very pleasant and rewarding moment for President Barry Baillie to accept the Deric Homes Memorial Trophy on behalf of all of our members and let us now look forward to many more such bowls occasions for this great county of Sussex. DHMT= Deric Homes Memorial Trophy (Formerly Surrey Cup). Continuing the theme of good news our excellent young bowlers yesterday finalised their position in the Under 25 Inter-County League with an impressive final score against Hampshire of 103 - 39 and in so doing winning all 22 points for the match and with it an unassailable position as the WINNERS of the League for the second time since they entered it just a few years ago. It really is an outstanding performance by the whole team which includes both Ray Leggett and Barry Torode as their Managers and Sussex County IBA are as proud as puch for their accomplishment this season which was made more difficult with one or two of the regular bowlers being unavailable. It truly is a significant achievement and I know I go on about it a bit too much some would say but these lads are the future of Sussex Indoor Bowls and they will become the nucleus of the teams that will in my view, lift the Liberty Trophy for Sussex before too long...and let's not forget the many individual trophy wins many of these young players will realise in their bowls lifetime. I'm proud of them all and I know that all of Sussex are equally delighted with their second win in the Under 25 Inter-County League and what seems like a bright future for them and for us! 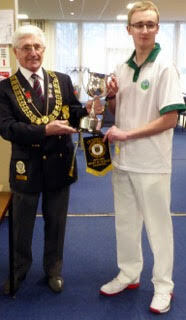 Well Readers.......two pieces of county team competition news for you to digest today. Yesterday at Arun IBC Sussex welcomed visitors Hampshire to the second match in the Home Counties IBA League. As was to be expected Hampshire brought their 'A" team and the Sussex players were confronted by a host of recognised bowlers from across the county line. Not to be overwhelmed Sussex started out well and gradually pulled away from the opposition. The scoresheet tells the story but this tae was one with a happy ending because Sussex won the match 132 - 106. Winning on Four (4) rinks and losing narrowly on two (2) rinks. Out of a total of 22 points which were available Sussex took the lions share of 18 points leaving Hampshire wth 4 points. The match was played in good spirits and in a very competitive manner. Thank you to all those Sussex players who stood by their commitment to the County and to Iain Donaldson our National Team Manager for a sound selection. The winning bug is a phenomenon that can grip a sporting team and I for one would very much like to see us remain in its' hold for a long time to come. Well done to all involved. As soon as I have an up to date league table I wil publish it....promise! Team Photo of winning team v Hampshire on 11/02/18 at Arun IBC in the Home Counties IBA League. Sadly our Under 25 Double Rink fighting for a place in the National Finals lost to Essex by a combined score of 48 - 35. The players will be unhappy at the result but Essex turned out a strong pair of rinks and it simply wasn't Sussex's day! However, having said that our young players can be justly proud of themselves for coming through a tough three rounds of the event against serious competition. It's been quite a while since we could look at our Under 25 squad with pride for their achievements but all that has changed in the past few years with the current team managed by Ray Leggett and Barry Torode who have done a magnificent job. Of course it's fairly easy to manage a good team... and we do have a very good squad indeed! We congratulate them all on their progress over this period and we look forward with considerable pride ourselves to what the future may hold. We have a team that is not frightened to stand up and be counted on the green and they show it every time with their maturity of attitude, team spirit, commitment and just..great bowls! Some of these young men will go on to become International Bowling Stars of the future and some will may even feature in the Professional Bowls Association rankings to come. Isn't it great that they started out in our county? It is with reluctance and great disappointment we have had to cancel the SCIBA County Fives scheduled for 28th February, 2018 at The Grattons IBC. With a minimum target of 12 Club teams required, by the closing date (which had been extended a week) we had received only 7 entries. We put a lot of effort into trying to raise teams and I must thank Simon Pettingel as well because he rang around all his player contacts to get them to make sure their Club had put an entry in but in spite of all that the number required to make it viable was not adequate. I have asked Grattons to hold onto the competition another year so it will be put out to the clubs for 2019 entries in November/December, 2018 as usual. Meanwhile I have looked at the format of the competition and have tentatively suggested to Grattons that it should be changed from a club orientated framework to an Open competition that is team centred (ie: players from any club). I haven't looked at how that could be done but I think it would be possible. I have also suggested an increase in the Grattons sponsorship which SCIBA would match so that a monetary prize fund of at least £500.00 is on offer shared by the winners and runners up in the event. I believe if those changes can be made that we would attract the full number of teams not only for 2019 but beyond. It has to be agreed by the Sponsor (Grattons) first and I await the result of their Committee discussions. I shall keep you all updated. For those that did put an entry in... if you paid by cheque it will be securely shredded. For those who paid cash I will arrange to get that back to you as soon as I can. Onto other matters and I'm sure you will join with me in wishing our Under 25 National Double Rink players the very best of luck in their bid to reach the Semi-Finals of this competition. The quarter-finals match is being played on Sunday 11th February, 2018 is against Essex and they have a really good chance of winning it. Fingers (and everything else) crossed for them....come on lads..you can do it! Congratulations to Ajay Morphett who has reached the final stages of the National Under 18 Singles. He will be playing against a lad from Beccles and has a good chance of making it through...so all the luck we can muster for Ajay on Sunday 18th March, 2018. This date unfortunately clashes with our County Finals and I know both Ajay and his Dad Rob, are still running in County Competitions. If they reach the finals we shall simply have to arrange their match(s) for a separate time...the National Finals date was late being confirmed and our County Finals date was already finalised. We try our very best to set our finals so it doesn't clash anywhere with the Nationals but it is incredibly difficult not to hit one of them when the EIBA change their dates. To be fair the EIBA do apologise ahead of finalising their schedule so we have to expect the odd coincidence!! 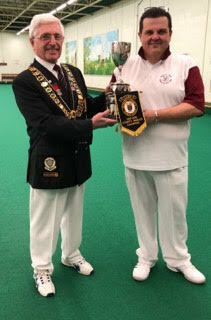 Commiserations to Steve Jeapes (Falaise) who went out in the Quarter-Final of The National Champion of Champions. Nonetheless for that a really great showing Steve..well done. Footnote: Kent who bounced us out of the Liberty Trophy are still going strong. If they win we can at least say we were beaten by the eventual victors!! 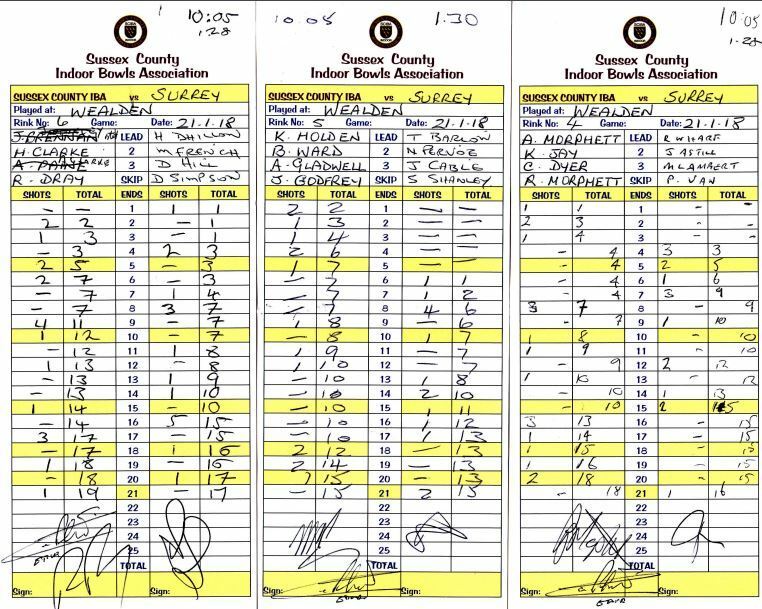 Latest quick report from our Under 25 Manager, Ray Leggett in regard to the U25 Inter-County League and I quote: "another well deserved win for the team against Essex at Ilford today, they won on two rinks and lost by one shot on the other, won 88 shots to 42 shots and picked up another 18points, well done to Ajay who skipped for the first time today and to the rink skipped by Reece who won 49 - 5 another very good display from our bowlers." It's encouraging to see these yougsters of ours doing their best to bring it home for Sussex and we owe them as much support as we can muster. If you have the opportunity to watch their matches at all you will be greatly impressed with the standard and commitment these excellent bowlers display. 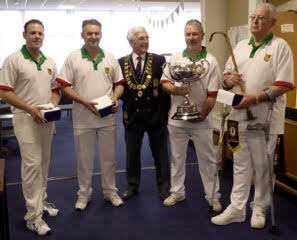 The third round of the National Over 60 Inter-County Knock Out took place at Adur and Egham IBC's. This was a much closer game at both venues and we discovered we were playing most of the Surrey bowlers who dismissed us on Sunday but this was by no means as straightforward for Surrey as they might have expected after Sunday. The matches at both ends were all over the shop when one looked across the the rinks.... I was at the Adur tie and the three rinks could not have been more different from each other with a Sussex heavy loss, a spectacular win and a fighting recovery so it was all there for the spectator. Having said that and noted our rinks at Egham had done a really good job of keeping the score down it should have been a match we could easily have won at Adur had we not had such range of scores and with hindsight we really should have taken the credit in my humble opinon! However, we did not and we fell short overall by a frustrating NINE (9) shots! Nine shots over 6 rinks...we were that close to a 4th Round meet against Devon CIBA. Never mind... our lads showed they are quite capable of winning through and this year we progressd to the third round which was further than we had ever done before in this National Competition dubbed the Veteran's Liberty Trophy. Putting a positive spin on things we definitely developed and grew as a team and I would go so far as to say we made something of a "breakthrough" having gone the distance that we did. It makes next season's Over 60 Inter-County a much more exciting prospect and there is no doubt we can reach the final stages of this competition simply because we almost did this time....just a measly 9 shots was the difference. Well done to all those who played in this competition and to both Iain Donaldson and David Hubbard for their selections. We should all feel very proud of our efforts and be itching for next season to come around!! Good luck from Sussex to Surrey who will play Devon on the 20th February, 2018. It is a tough draw but it would be good to see those that won over us go on and reach the Final. PS: As a postscript to this report I can confirm that those unbadged players who were selected and played in this competition will receive an additional credit towards their county badge if they played in two rounds of the competition. In future an unbadged player who is selected and plays in a minimum of two rounds of the National Over 60 Inter-County Knock-Out competition in a consecutive period of three years will receive an additional credit toward his County Badge Award. It is hoped that an "Over 60 Inter-County K.O." flash will also be made available to those who have been selected and played in this competition on at least three occasions....bringing this competition into line with how we recognise those who play in the Liberty Trophy. Our first Home Counties League match of the current season against Surrey County IBA did not quite go to plan I'm sorry to report. We were overwhelmed by a strong Surrey contingent that led from the off and held us in their grip throughout the game running out winners 129 - 78. No excuses...we were beaten by a better side on the day and must regroup for the second Home Counties League match against Hampshire IBA on the 11th February, 2018 at Arun IBC at 10.00am. Supporters most welcome as I suspect this match may produce a tighter scoreline but will not be easy...let's hope for a better result all round though! Following a recent reshuffle of County personnel Iain Donaldson (Worthing) is now the SCIBA National Team Manager with immediate effect. David Hubbard (Adur) stays on as SCIBA Consultant on National Team selections working with the National Team Manager as he prescribes. It is anticipated that Iain Donaldson (Worthing) will wish to appoint an Assistant but as the current season is within sight of ending this may not be made firm until the new season. SCIBA thanks David Hubbard for all his efforts on the Liberty Trophy, Liberty Trophy trials and subsequent selections and for his leadership as the Liberty Trophy Team Captain...we hope he will continue to lead the Sussex County team onto the green in the Liberty Trophy competition next season and will continue to be available to Iain when he finalises selection for this top National Team Competition. Both men have the full support of Sussex County IBA. some quick news to report on our Under 25 Inter-County League progress this season from the Manager, Ray Leggett... quote,"just to let you know, a really good performance again from our team at Horsham to win on all three rinks with the score Sussex 89 Surrey 27.5 giving Sussex 22pts and Surrey 0pts. Sussex Under 25's continue to fly high in the inter-county league and athough we mustn't count our chickens just yet things are set fair for the remainder of the season! ALAN STEWART - ARUN & CHICHESTER... R.I.P. I'm so sorry to be the bearer of bad news but I've been contacted by the President of Chichester BC to request a few lines of notification on our pages regarding the very recent demise of ALAN STEWART both a long time Member of Arun Indoors and also of Chichester B.C. outdoors. Like me there will be many who will be shocked to hear of his sudden death... it occured between the Christmas and New Year breaks. 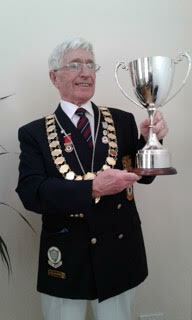 Alan was a founding Member of Arun District Indoor Bowls Club and was very, very well known throughout Sussex. He was a stalwart of Chichester B.C. outdoors and his passing will be a huge loss to both clubs. Alan was a regular player with the West Sussex & Bognor Tourists and will be fondly remembered for his fun, undeniable passion and love for the sport of bowls and the many social occasions that were enjoyed whenever Alan was present. Simon Tooley, Chichester BC President has been in touch with Alan's family (Jacqui...his daughter) and here are the details of the funeral: Tuesday, 16th January, 2018 at Chichester Crematorium followed by a wake at The Chichester Hotel (virtually next door to the crematorium). Jacqui has requested there only be flowers from the family but those that wish can make a donation to the two charities Alan held closest to his heart....St. Wilfrid's Hospice and "Action on Hearing Loss." Please make your cheque out to Reynolds Funeral Services, High Street, Bognor Regis, PO21 1RR along with a covering note "In Memory of Alan Stewart." Should you wish to send a supportive sympathy card or a letter please address it to Ms. J. Stewart, 39, Halnaker, Chichester, PO18 0NQ. Alan's loss will leave a big hole in Sussex Bowls... not just at Arun Indoor and Chichester outdoor but throughout this County. When someone of his standing within our sport passes away suddenly we lament being unable to have said our goodbyes and in Alan's instance not simply our goodbyes but our abiding thanks for what he meant to bowls in Sussex. I'm certain Alan knew that he was truly appreciated by all of us for what he personally brought to bowls in Sussex but I guess it wouldn't be inappropriate to say it just one more time...."thank you Alan for everything you did to perpetuate and better our sport and the immense joy you brought to it...we'll miss you and we will remember you with fondness & affection......and yes, always with a smile.......because through your own achievements you have helped all of us to smile that little bit more often." Alan...your journey is ended...Rest in Peace my friend."